Studio on Cerritos Beach, Full bathroom & Kitchen, Private Beach Access. This is a genuine slice of paradise. I recently completed building this home and I'm looking forward to sharing this tranquil space with you. Enjoy the picturesque waves. Drop a fishing line in from shore or eat baja fish tacos in the nearest town of Pescadero. Grab your board and surf, or rent one from just down the beach! Have a picnic, watch the ocean life jumping and play in the water in front of you. After sunset, enjoy the bright moon and starry sky. There are ATV rentals, horseback riding and hiking all within a 5 km / 3 mile radius. We are conveniently located 15 minutes away from the charming artisan town of Todos Santos and 45 minutes away to Cabo’s night-life. We can also accommodate large groups of up to 14 people. Enter through the secure, gated entrance where plenty of parking is available. There is a wonderful beach area right in front with a shaded outdoor bed, recliner chairs, and hammocks on the sand where you are welcome to hang out and enjoy the sun or stars. It’s a private beach out front, which will only be shared with other guests of the property. Looking forward to saying hi! If I'm not here though, my caretakers will be able to handle your check-in and check-out, and any questions you might have. You have a private deck and suite, however there may be other guests on the property staying in one of our other suites. Having a vehicle is essential in order to get around. There are spectacular places to check out as well that create more incentive to rent a vehicle during your stay (waterfalls, other beaches, small colonial towns, restaurants, etc.). The local township of El Pescadero is about 5 minutes up the road by car while Todos Santos is an additional 10 minutes north and boasts some of the greatest festivals/art shows and specialty items of the Baja. At various times of the year you can catch whales migrating, turtles hatching, and some of the best surf in the world. People are very friendly in this area, and if you simply want to kick back and enjoy the tranquility, you won't find a better place. Free from noise and hustle-bustle, this is a gorgeous getaway vacation home. There is a convenience store across the road and a delicious locally owned restaurant next door from it that prepares authentic cuisine. Buses run usually every hour however it is necessary to have a car in Baja in order to get around and have a stress-free and fun vacation. Most of what you'll need supply-wise can be found in the small town of El Pescadero, a 5 minute drive up the road and for specialty items and a slightly more active atmosphere, the larger town of Todos Santos is only 10 minutes further north or the drive to Cabo is a quick 45 minutes if you'd like to check out the city hub or night life. I am a retired Canadian living the dream on a beach I've been coming to for over 20 years. Originally from east coast, I moved west in late 70s. I've traveled to over 60 countries and have been riding motorcycles all my life. More into off-road in Baja, I still love a good road trip. I've owned an RV for over 20 years now and that's how I found Los Cerritos in the late 80s. I love the sunshine and the great climate we have at Los Cerritos, year round. With the Sierra Laguna mountains behind me and the Pacific ocean in front of me, I realize it's a slice of paradise. Watching whales November thru March from my deck is amazing, and the stars at night are heavenly. People are very friendly in this area, and if you simply want to kick back and enjoy the tranquility, you've found the best option right here. Safe & secure, free from noise and hustle-bustle, this is a gorgeous getaway vacation home. Make some memories in your very own slice of paradise. There is a convenience store across the road and a delicious locally owned restaurant next door from it that prepares authentic cuisine. Right across the street is a uniquely themed bar/restaurant named Art & Beer. This property was built with the planet in mind and is entirely eco-friendly. All power is solar and all water is trucked in, which makes it a unique and valuable experience without giving up many of the luxuries of a resort. The hot water is unlimited and on-demand - excellent for showering. There is a private beach, secure beach access. Internet is High-Speed unlimited Wi-Fi. For any further questions please ask myself or my housekeeper and we'll be happy to help. As well, since I am familiar with the surrounding area and businesses I will be more than happy to help suggest or arrange guided tours and other activities based on availability and the season. You are so close to the breathtaking Pacific ocean here. Swim & Surf to your heart's content. Plenty of seclusion lets you get away from it all quite easily. The ocean in front and the mountains behind. Small towns dot the landscape. The beach is right outside your gate. You can walk along the sand 2 km right to the point-break, where there is a beach bar & restaurant. Behind you are the Sierra Laguna mountains - beautiful. Great off-roading trails too. Enjoy the ocean view all day, from your breezy patio or the shady palapa on the beach. One of the most wonderful spots to enjoy the Pacific ocean is right outside. No land-line here, but cell reception is good. If your phone doesn't roam well, you can buy a phone and plan at your local OXXO convenience store. Very inexpensive. Collect your own fire wood but enjoy a fire right out front on the beach. Plenty of parking available. Safe and secure. Whether you're driving a rental car or have brought your own truck and trailer, you have all the space you'll need. Unlimited, high speed Wi-Fi. Streaming. Netflix. Youtube. etc. All dish, beach and personal towels provided. The living room is cozy and quaint in this studio. Perfect for 1 traveler and romantic for 2. Large fridge with freezer. High-efficiency, no power concerns. 4-Burner stove top runs on connected propane line. Percolator is available, but no electric coffee maker. Salt, pepper, dish soap, and two 5 gallon drinking water jugs are provided. Your basic cookware needs are covered, as well as your dishes and utensils. The kitchen includes a full sink, 4-burner stove, cookware, dishes and utensils. It is an open-flow design in this studio that welcomes you in easily as you walk through. A small area for dining in the evening doubles as a great breakfast area. Look out to the ocean as you enjoy your meals. Able to connect to Netflic etc. but no cable. There are books in nooks. Horse-shoes, Bocce Ball, Bat-A-Ball all for your use. Also, cards, monopoly and cribbage available upon request. Outdoor shower with hot water and succulent garden. Can be rented in todos santos, high quality for adventure mountain bike enthusiasts..need a guide along because they are expensive. Outside of your entrance is a perfect little patio looking out towards the ocean. A great spot to sip a cool refreshing drink. Boogie board rentals on site, surf rentals down the beach and snorkeling/diving/fishing could be arranged with an affiliate company. My husband and I spent a week at Studio Gaia away from the cold and snow at home. The space had everything we needed. After a stop at Mega, we were able to fix most of our meals at the studio. There is a cook top, a bar sized refrigerator and all the essentials for cooking in the unit. Fred lives on the property and was always available if we needed anything or had questions. This property is directly on the beach, and there is literally no one else in either direction except for a stray walker with their dog. We had several bonfires while we were there in the evenings after sunset over the Pacific. There are palapas, hammocks, some toys and games for relaxation on all those warm, cloudless days. Everything was very clean and well maintained. All of the furniture covers, bedding and towels are washed and line dried after each guest. There are 2 larger rentals on the property, so it would be great for families. This property is totally fenced and secure. We plan to go back again next winter! Nice getaway right on the beach! We had a lovely stay at studio gaia. You will have the entire beach to yourself and we watched whales playing in the water a couple mornings. Fred provides everything you could want for a beach adventure. There are surfboards, boogie boards, wood for a fire, beach games, and many options for shade, hammock, and lounge chairs. We had a little trouble finding the place at first. The shower was a little temperamental and was hard to get the temperature to stay frequent. Also be aware that this is on the bottom level of a two story. All in all the stay was great and we had a wonderful vacation. Thanks Fred! We loved our stay away from it all! Had the beach to ourselves most of the time. Fell asleep to the sound of crashing waves. We loved our stay at Studio Gaia, so hard to leave this beautiful place!! Fred was always quick and prompt with emails and very caring owner and helpful with any questions or requests. The location is right on the beach can't beat that! I love hearing the ocean and watching the whales and the beautiful sunsets. We would love to stay here next time but we aren't sure yet when will be back, hopefully this year though. 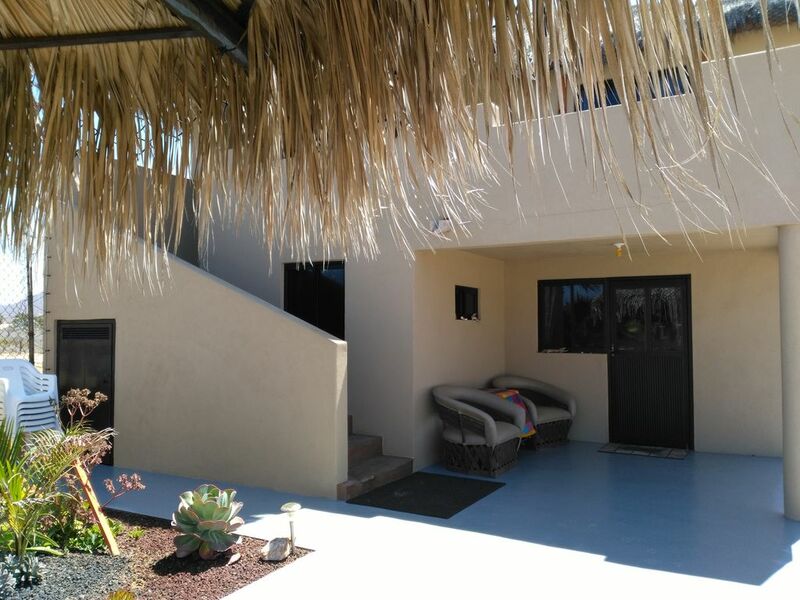 Fred, the owner is very helpful, the casita is wonderful, and the beach is yours. we stayed for 4 days and thoroughly loved it! A very relaxing place to stay. We enjoyed the proximity to the beach, Cabo, and Todos Santos. Fred was very helpful and offered suggestions for local activities and attractions. Overall, a very nice studio on the beach with beautiful sunsets. Nearby is the township of El Pescadero and 10 minutes further North, you'll find the slightly larger town of Todos Santos. Excellent restaurants, friendly locals, safe and accommodating. Plenty of wonderful natural spots all around that are great for exploring. Cabo San Lucas is just a quick 45 minutes south if you'd like to explore the marina, shopping centers and exciting night life ! Enjoy all the freedom that Baja has to offer, right here. I live on the property also in the other house. I am usually available if you there is something you require. The property is large and tranquil.